I finished up my Kona Challenge quilt this week and am so excited about that one. We're having the big reveal at Modern Quilt Guild in a few weeks so I won't be posting pictures here until after that. It's actually going to go on the living room wall. That's a big deal because I'm not really into hanging quilts. I pieced my Farmer's Wife quilt top this week as well. I just hate unfinished projects laying around. Besides, I was stalled on other projects so I decided to finish this one up. It's approximately 42'x52" finished. I am glad I decided to stop while I was ahead and just make it into a baby quilt. I still feel a bit "meh" about it, but it's growing on me now that I put it together. 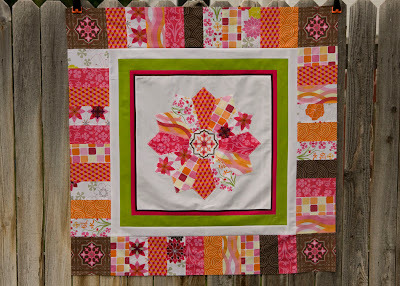 The one big positive is that this quilt has inspired my layout for my Heirloom quilt. I might start cutting that tomorrow, although it's always scary to cut such great fabric. I frequently have commitment issues when it comes to cutting. I'm very stalled on this one. I just can't think of what to do next. It's currently about 35" square. I really want it bigger for a baby quilt. It's currently just hanging on the wall waiting for inspiration to strike. 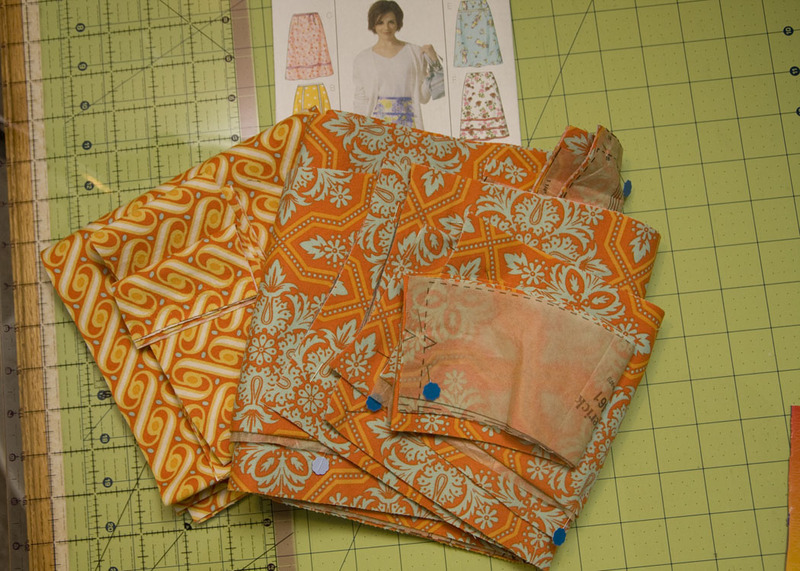 This fabric is all cut and ready to be sewn into a new skirt. I'm using the same pattern as last time, but with some pretty significant alterations. I'm keeping my fingers crossed that it all goes together as planned. I'm also putting together a fun little project I hope to announce this weekend or early next week. Your FW quilt looks great! Good for you for finishing it up. I'm sure it would've been easy to let those blocks sit around for a long time. I know it will be well loved by a future baby! Your dresden is so pretty. I know you'll come up with something awesome. I love those fabrics for your skirt! The FW blocks look great together, and I am glad you have finished it off. I just love that dresden, I will watch to see what you do next, there is no rush, sometimes you just need a little time for the idea to develop. 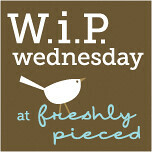 Your dresden plate top is gorgeous! Curious to see what you add to make it larger. Both quilts are GORGEOUS! We're always our own worst critics, but seriously that baby quilt is SO pretty! 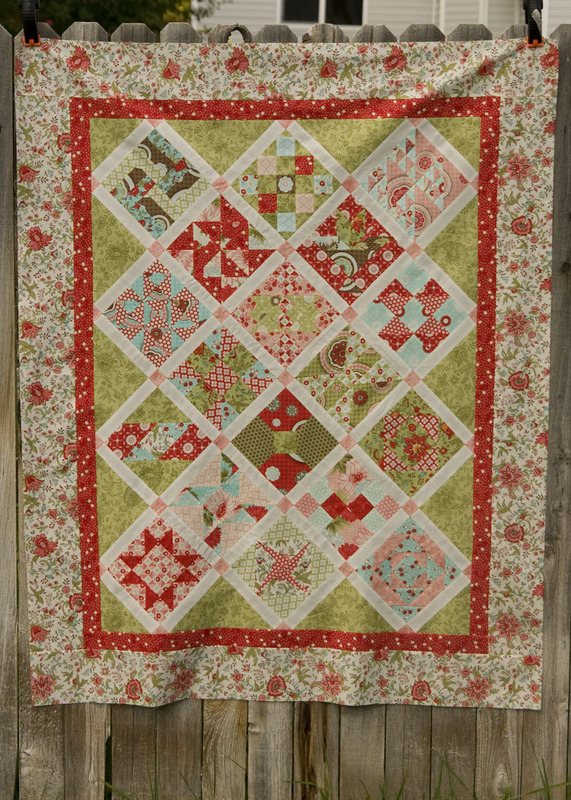 I LOVE the Farmer's Quilt top! and I'm not always a huge fan of "sampler-style" quilts, but this one is really great!! I know you weren't crazy about how the blocks were coming together but seeing it in this completed top it looks wonderful! This is very nice! I can't wait to see your Kona Challenge quilt. I'm sure it will be stunning! Your Farmer's Wife quilt looks great! Sometimes I think sampler quilts look a little disjointed, but this one isn't at all. Really wonderful! I also love the Farmer's quilt! I'm sur eit will grow on you! Kristen has a good idea, setting the dresden on point. Once you have some triangles on the corners I sure you'll see it with fresh eyes and be inspired by the next round! I love your FW baby quilt! the borders really pull it together. I'm not sure what I would do to the large dresden either...possibly add another wide border in a solid? Hmm...can't wait to see what you decide! That skirt will be gorgeous, yummy fabrics! 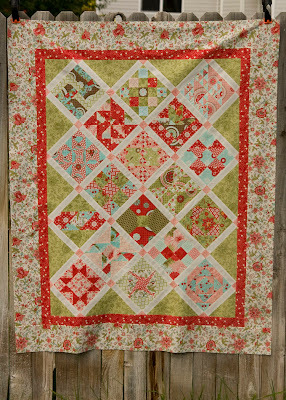 I really love the FW baby quilt, it looks fabulous, love the cornerstones, and the borders. It's almost made me want to try some of those blocks, hmm, maybe not. I have no idea what you should do with the Dresden either, sorry. It's all great!! Can't wait to see your solids masterpiece!! Everything is so lovely. As far as the Dresden goes, I have an idea just to throw out and see if it might be helpful. You know how you did the solid colored borders around the actual block? Why not reverse order them and do one more round? For example, start with a very thin white line, then a slightly larger green, a larger red and end with the darker color on the outside. You could bind it in that darker color too so it just stops at the edge with that color. Just a thought! I know you'll come up with something great! Maybe some more white, green and pink solid borders for the Dresden quilt? The colors your chose for all your projects are great! So comforting yet colorful. I recently bought the FW book, but I think it is going to have to sit on the shelf until next summer.